Maybe I should make it 3 because I really like the cover. I was under the assumption that this was a young adult fantasy novel but was mistaken. Okay, so this one's a mix of dystopia and fantasy, taking place in a world where humans are near extinction and Centaurs rule the world, our world to be specific. 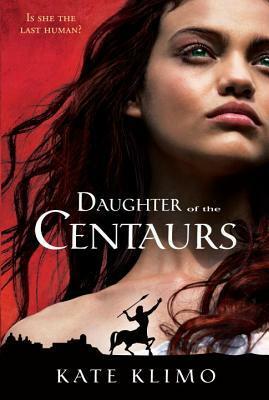 Although Daughter of the Centaurs was initially slow and hard to get through,the pace picked up after around 30% into it and the story improved. Malora's likable enough, although nothing extraordinary. She hopes to train horses like her father but unexpected disaster falls upon her settlement, forcing her to survive in the wild. First off, we don't know how this world came to exist, all we know is that it just is, which personally, doesn't make any sense. I like dystopian/post-apocalyptic and fantasy novels but I need a background of how the world came to be to keep me interested. I was hoping for an epic fantasy series based on something other than faeries and vampires for once but the story fell flat for me. In my mind, I pictured Centaurs to be a dignified race, old and wise like something out of Harry Potter but more sophisticated. In Daughter of the Centaurs they were depicted as shallow creatures who're also a tad silly. Oh sure, they're supposed to be nobles. They have their own cat-like slaves who, to be frank, were a little weird. The writing itself was inconsistent , the flow was disjointed and left me with a lot of questions. There're way too many holes in the plot which I assume the author plans on explaining in the next book but it just wasn't enough to make me like this book. Daughter of the Centaurs had a fresh idea but didn't follow through on it's promise. Hmmm, I thought this one sounded good too with the centaurs taking a role. What a bummer that you were disappointed! i remember reading this story by Harry Turtledove about centaurs who were portrayed in a similar way. they were supposed to be losing ground because the human had evolved. I liked it. Maybe cuz of how the story was told.